In the three seasons prior to Head Coach David Cutcliffe's arrival in Durham, Duke compiled a record of 2-33. Those results were really nothing new, as the program had been mired in losing seasons since 1994. The majority of those Duke teams were filled with outstanding student-athletes, but few true BCS-caliber football players. With a few notable exceptions, the Blue Devils rarely were able to beat out other BCS schools on the recruiting trail. 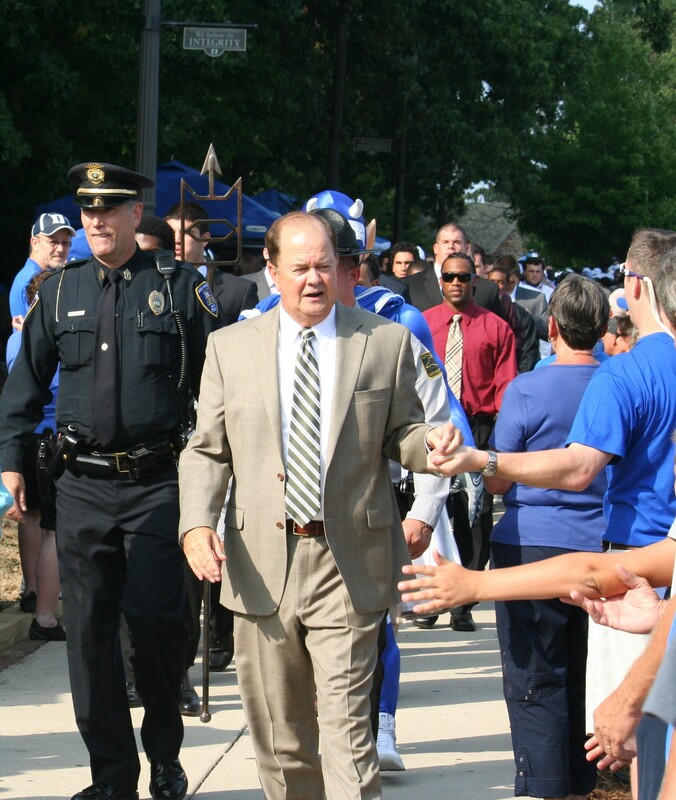 When Cutcliffe arrived in Durham in 2008, he charismatically promised to change all of that. The initial results were encouraging; with better coaching and conditioning alone, the Blue Devils improved their win total in each of his first two seasons. Those who followed the program closely, however, knew that much remained to be accomplished if Duke was to compete for an ACC Championship. The program that Cutcliffe and his staff inherited was significantly limited by its substandard facilities, inadequate support, and, ultimately, a lack of respect from opponents. If Duke planned to compete consistently with ACC and SEC powers on the field, they would have to beat them off the field first. Thanks to the vision of Coach Cutcliffe, along with the enormous generosity of Duke University and its boosters, the Duke Football facilities are now among the best in the conference. The Blue Devils now boast a full-length outdoor practice facility (the Brooks Practice Facility) along with a full-length indoor practice facility (the Pascal Field House). With millions of dollars in improvements to Wallace Wade Stadium planned, Duke's football facilities will not only be on par with the rest of the ACC, but will be among the best in the country. Fans are starting to take notice, as the Blue Devils surpassed 30,000 in attendance at 9 of their past 27 home games, a milestone they had reached just four times in the previous 8 seasons. But on the surface, the Blue Devils appeared to have taken steps backwards in 2010 and 2011, winning just three games in each of the past two seasons and suffering a dozen heartbreaking losses. Some fans have grown frustrated with the perceived lack of progress with the program. But those fans are truly missing the forest for the trees. Restoring Duke football to the top of the ACC was never going to happen overnight; it was always going to have to be a marathon, not a sprint. Fast forward to the summer of 2012. All of that work behind the scenes and off the field has finally begun to produce tangible results for the Blue Devils. Back in February, the Blue Devils pulled off their biggest National Signing Day haul in years, securing last-minute commitments from in-state stars Jela Duncan and Keilin Rayner. Duncan, a speedy running back who had been at the top of Coach Cutcliffe's recruiting board since early 2011, chose Duke over ECU, Pittsburgh, Purdue, and Wake Forest, and spurned UNC as well after the Tar Heels made a late push. Rayner, a first-team all-state selection at linebacker who bench presses over 400 pounds, committed to Duke over Clemson, ECU, NC State, UNC, and South Carolina. With a solid recruiting class having already committed, the late additions of Duncan and Rayner helped to create one of Duke's top classes in years; several of the incoming frosh are expected to contribute this fall. As it turns out, Coach Cutcliffe and his staff were just getting started back in February. To date, they have secured verbal commitments from a total of 14 players in the class of 2013 and already have their first from the class of 2014 in LB Zavier Carmichael. Yesterday, they added yet another highly-coveted player in Terrence Alls, a terrific all-around receiver from Dade Christian HS in South Florida. Alls joins three other Floridians in the Duke's class of 2013 -- QB Parker Boehme, ATH TJ Douglas, and WR Johnell Barnes. Before committing to the Blue Devils, Alls had received nearly 20 scholarship offers from BCS programs across the country. In fact, led by the commitments of Alls and CB Evrett Edwards, the Blue Devils have begun to beat out not only ACC programs, but also Big Ten and SEC programs on the recruiting trail. The Duke class of 2013 already contains a number of highly-recruited players, and it's still nearly six months from National Signing Day. Air Force, Akron, Arizona State, Arkansas State, Ball State, Boston College, Bowling Green, Buffalo, Cincinnati, Clemson, Connecticut, ECU, FIU, Florida Atlantic, Georgia State, Georgia Tech, Hawaii, Houston, Illinois, Iowa State, Kansas, Kentucky, Marshall, Maryland, Massachusetts, Memphis, Mississippi State, Navy, NC State, North Texas, Northwestern, Ohio, Old Dominion, Ole Miss, Penn State, Pittsburgh, Purdue, SMU, South Carolina, Temple, Tulane, UCF, USF, UTSA, Vanderbilt, Wake Forest, Washington State, West Virginia, Western Kentucky. For those of you counting, that's 29 BCS AQ schools (including recent expansion changes) that Duke has beaten on the recruiting trail for just their first 14 commitments in this class. With several scholarships remaining, and with the Blue Devils making the final cut for several top prospects, the best might be yet to come. Of course, now that the Blue Devils have begun to beat other ACC programs for coveted recruits, it's time to start beating them on the field. But even if Duke's first winning season since 1994 ends up being a year or two away, it's clear that the Blue Devils are no longer an afterthought among the FBS ranks. The 2012 campaign kicks off at 7 PM on Saturday, September 1st in Wallace Wade Stadium against FIU.